A version of this article also appears on the Studio 3 Gallery blog. In the space of ten seconds, how many female artists can you think of? Off the top of my head I counted four female artists – Artemisia Gentileschi, Barbara Hepworth, Marina Abramović and Tracey Emin – and about seven male artists – Raphael, Michelangelo, Velázquez, Damien Hirst, Rubens, Leonardo da Vinci and Picasso. You can do the same exercise over and over again and still find more male artists than their counterparts. Female artists in general have been under-represented throughout art history. Art-making and the training that preceded it was an intensely expensive activity. Those women artists who did succeed were usually from wealthy backgrounds, whether through marriage or inheritance. In other cases, the lack of female artists was largely due to gender biases in society and also the dismissing of their work as ‘craft’ rather than ‘fine art’. It is precisely this that UNDEREXPOSED takes as its starting point. Through the medium of print, it attempts to elevate and shed light on the work of female artists, past and present. Diana Ghisi, The Holy Family, after Raffaellino da Reggio, c. 1575. Own photograph. The choice of works are almost entirely by artists of the 20th century and the present day. 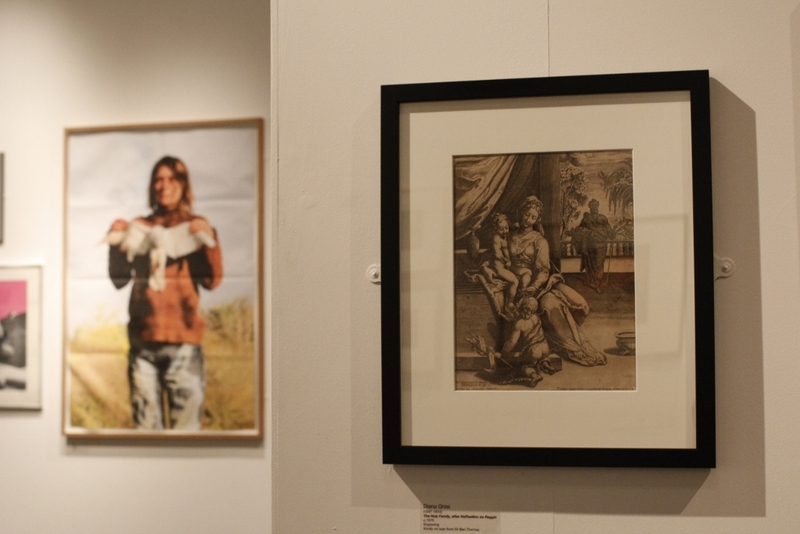 Being a heavily budgeted exhibition curated by University of Kent students Lynne Dickens and Frances Chiverton the choice to include older works was made more difficult by their limited availability. However, a wonderful print of a Holy Family (c. 1575) by Diana Ghisi did make it into the show under the generosity of Dr Ben Thomas. Ghisi, also known as Diana Scultori, was an Italian Renaissance engraver who is recorded as being the first female artist allowed to sell her own work under her own name. The inclusion of this print stands out as a historically significant statement amongst the rest of the works that women artists did exist and succeed before the 19th century. Just around the corner of the same wall are two prints by Berthe Morisot and Mary Cassatt, kindly lent from the Victoria & Albert Museum Print Collection. Both artists were deeply involved with the Impressionists during the late 19th century, the former being well acquainted with Édouard Manet, the latter with Edgar Degas. Thematically, their work focuses on the culturally restricted lives of women, evident in Morisot’s choice of domestic settings and Cassatt’s specific interest in mothers and children as subjects. Unlike their male counterparts, these women provide us with a glimpse of women’s private lives from the perspective of one who is also restricted by the same rules as imposed by society. These artists have empathy for their subjects. 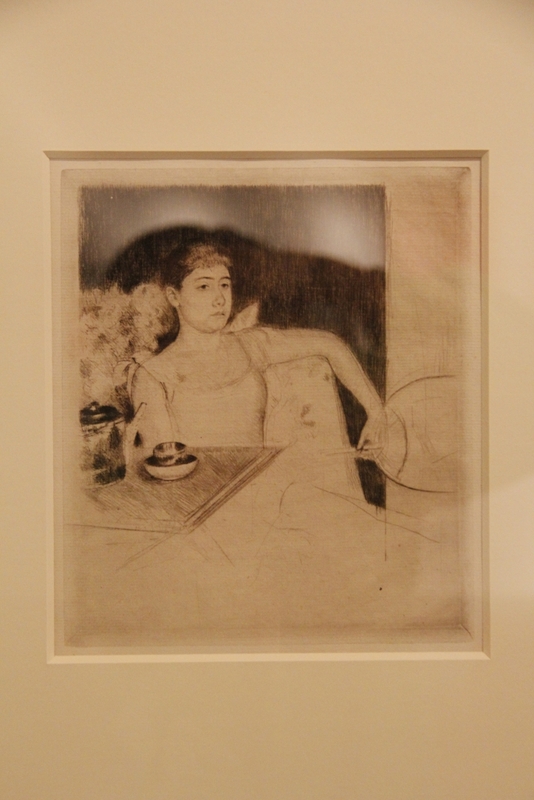 You can almost feel their unspoken pain in the vacant expression of the fan-holding subject in Cassatt’s Tea (1890). Mary Cassatt, Tea, 1890. Own photograph. This exhibition attempts to provide the viewer with a small sample that displays the richness and variety of ideas and techniques exploited by these artists. Towards the latter end of the 20th century we have seen a flourish of successful women artists. Royal Academicians like Anne Desmet – whose Babel Tower in Pieces (1999) is one of three pieces in the exhibition – are examples of women’s recognition within the art world – and society – as artists worthy of praise. Tracey Emin’s appointment in 2011 as one of two Professors of Drawing at the Royal Academy of Arts since its founding is proof of this. One of her autobiographical prints proudly hangs in the foyer of the School of Arts building beside an edition of the Guerrilla Girls’ Do Women STILL Have to be Naked to Get Into the Met. Museum? (2012). 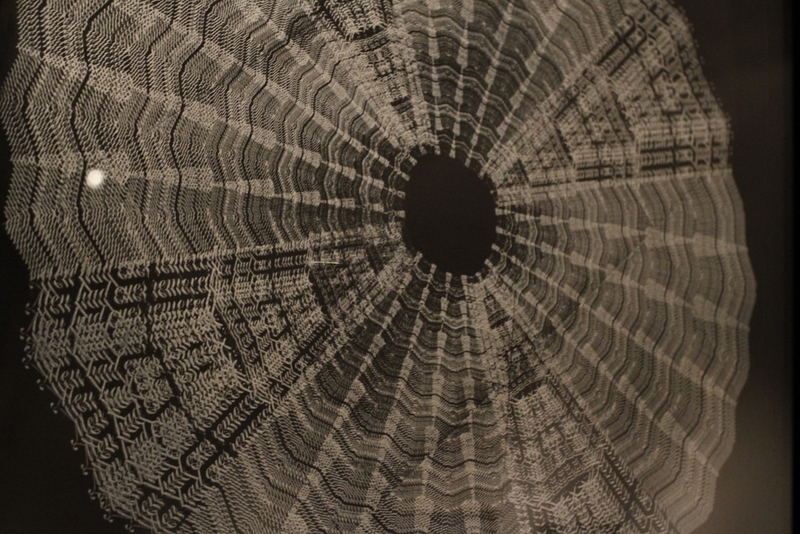 Artists exhibited in the show include Kent University alumni Dawn Cole whose solar plate etchings allude to pieces of white lace. Her series Reading Between the Lines take passages from a diary written by her great aunt during her time as a WW1 Voluntary Aid Detachment nurse. The diary records some of the wartime horrors and incidents at the hospital, and passages like “Men had their eyes removed” are interwoven into the lace-like patterns of Cole’s work. Dawn Cole, Men Had Eyes Removed, 2009. Own photograph. Gwen Raverat proved to be a fast favourite at the private view – and not simply because of the £100 price tags on two of them – while others took interest in Barbara Hepworth’s minimalist lithographs and screenprints. Charlotte Cornish’s vivid abstractions raised a few eyebrows too, and what a pleasure it was to see some of Bridget Riley’s works – Frieze (2000), Two Blues (2003), Composition with Circles (no. 5) (2005) – whose conceptions are always made with the medium in mind, taking into account their size and effect on the viewer. However, big names like Sarah Lucas weren’t necessarily the most popular as evidenced by Lucy Farley’s silkscreen print To the Lighthouse, Ile de Re (2013) – directly opposite the former’s Squab Squaw (2011) and Sarah Hardacre’s openly controversial screenprints of women in urban settings – generating much discussion among visitors to the exhibition. Farley studied BA Fine Art in 2001 at Central St. Martins and specialised in printmaking at the Royal College of Art in 2007. She is currently undergoing a fellowship at the Royal Academy of Arts and she has exhibited in several small-scale group shows over the years. 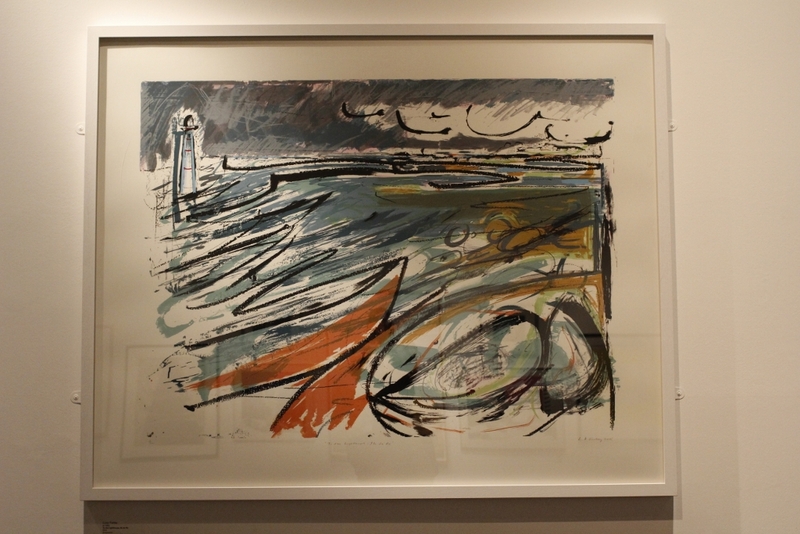 The subject of her work is usually urban and rural locations with a great degree of expressiveness, bold use of black lines and atmospheric choice of colours, contrasting very well with the almost photographic quality of Alison Wilding’s lithographs of Starlings (2005). Lucy Farley, To the Lighthouse, Ile de Re, 2013. Own photograph. For figurative art there is a concentrated display of prints by Eileen Cooper, Anita Klein and Ana Maria Pacheco. These prints have a particular focus on women with the first two often incorporating the same figure in a large body of work. Cooper’s linocuts tend to be psychological at first glance – some might say surreal, others even Freudian. Their content is a mix between fantasy and reality with titles like The Moon, The Bird and The Bride (1992) and Walking on Air (2005). Her recurring figure is a naked woman. Klein, on the other hand, uses a clothed figure. Her themes often revolve around the idea of beauty in art and everyday life such as nature, romance, family and birds. 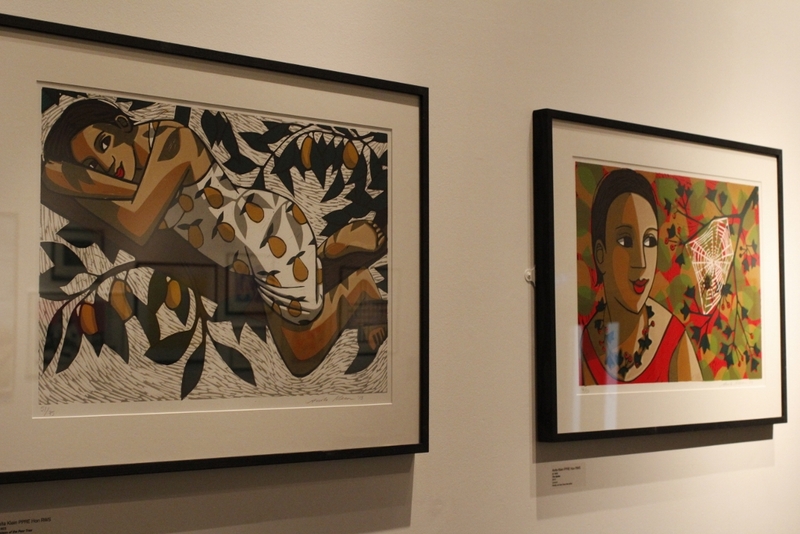 The prints displayed in the exhibition – The Goddess of the Pear Tree (2013) and The Spider (2013) – are part of the former category. In an interview in 2011, Klein said that she “grew up with a very strong sense of possibility of everything being taken away…I know that what I would miss are the very small things like having breakfast with my family, cleaning our teeth together… not holidays or birthdays or the photo-album version of life. Not the things we record but things that go past, slip through our fingers, things we don’t manage to enjoy” [full interview HERE] It is in the ordinary in which we find the most happiness and create the most memories. Anita Klein PPRE Hon RWS, Goddess of the Pear Tree, 2013; The Spider, 2013. Own photograph. This exhibition has a certain lightness to it, perhaps due to the variety of its displays. A range of techniques and media are explored here – woodcuts, linocuts, screenprinting, photo-etching, engraving – and the content is just as diverse – people, houses, sea, sky, nature, society, abstract forms – and it keeps on going. Not only does this show women’s freedom in exploiting the possibilities of art-making but also the analogous diversity in printmaking itself when compared to painting or sculpture. From a method used to allow artists to advertise and promote their art, as cheap reproductions of paintings – or labour-intensive equivalents to present-day postcards – to the idea of prints as a medium and original work of art in its own right. The exhibition is a celebration of women’s recognition in the art world and printmaking’s infinite possibilities; two understated aspects of society combined to create something beautiful and perhaps even moving. UNDEREXPOSED: Female artists and the medium of print runs until 19th June 2014 at Studio 3 Gallery, University of Kent, Canterbury, blogs.kent.ac.uk/studio3gallery.